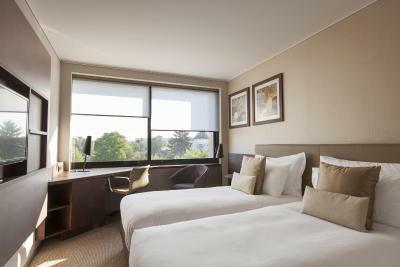 Lock in a great price for Crowne Plaza Geneva – rated 8.6 by recent guests! We stayed here because it is very close to the Geneva Airport and it provided a comfortable and convenient place to transition from our vacation to the long return flight back to the US. The service and allowed to check in early. Very nice. Free bus passes to explore the city. Location to connect to airport and trains. Everything location close to shopping mall close to the airport Mediterranean restaurant opposite the hotel close to the Mousqe and not far from city center and you can park your car in the hotel and used the bus no 10 both ways like train and more comfortable. 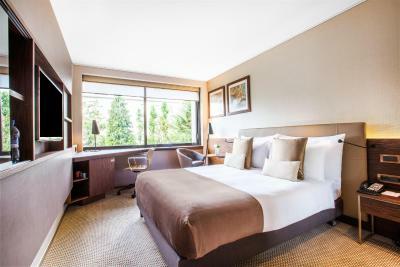 Clean, relaxing and nearby all facilities, ie airport, downtown..
Crowne Plaza Geneva This rating is a reflection of how the property compares to the industry standard when it comes to price, facilities and services available. It's based on a self-evaluation by the property. Use this rating to help choose your stay! 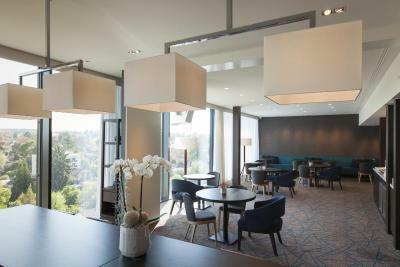 Renovated and redesigned in 2014, the Crowne Plaza Geneva is within a 3-minute drive of Geneva Airport and the Palexpo Exhibition Center, and only a 10-minute drive from the city center. 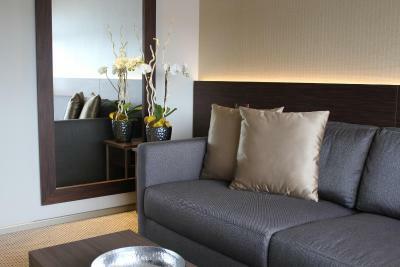 Free WiFi is available, and the hotel offers a free shuttle service from and to the airport. 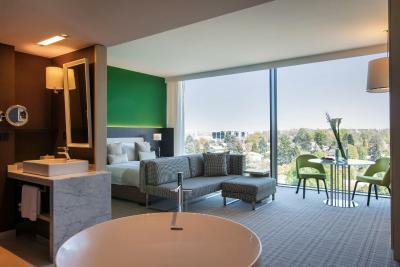 The hotel offers a Club floor on the top floor of the building, offering panoramic views of the surroundings. Club rooms and suites feature free access to the Club lounge. 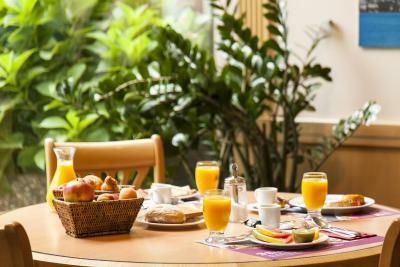 Guests here can benefit from a complimentary breakfast, refreshments and snacks and from a large selection of newspapers and books. The Crowne Plaza has 2 restaurants and a bar. The restaurant Seventy5 invites you to discover its creative and innovative cuisine, highlighting grilled meat, vegetarian dishes and seasonal products. In summer, it offers a terrace with a view over the garden. Café Jardin serves a buffet breakfast and a vast choice of dishes in a relaxing atmosphere at lunchtime. A terrace is available during summer. Every Sunday at noon, it serves a varied family brunch. 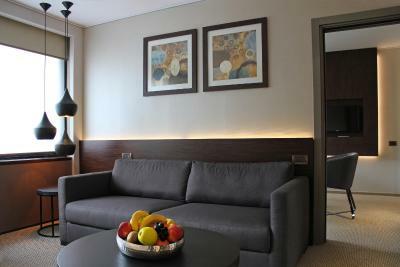 All rooms are equipped with cable and wireless internet access. Internet access is also available on the computers in the business center. A bus stop and a taxi stand are in front of the hotel. A free card for public transport is available at the reception. 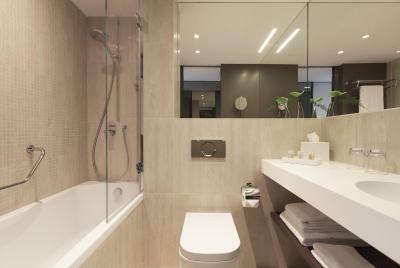 The hotel is only a 4-minute drive from the Balexert, Geneva's largest shopping mall. 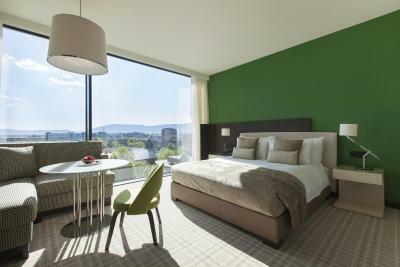 When would you like to stay at Crowne Plaza Geneva? Bright and comfortable double room with city or garden views, air-conditioning, free WiFi, a flat-screen satellite TV, a mini-bar, a coffee and tea maker, a safe, and a bathroom. Please note that the type of bedding cannot be guaranteed. It will allocated upon arrival based on availability. This spacious and stylishly decorated suite features modern furnishings, a large comfortable workspace, free internet access and luxurious bedding. 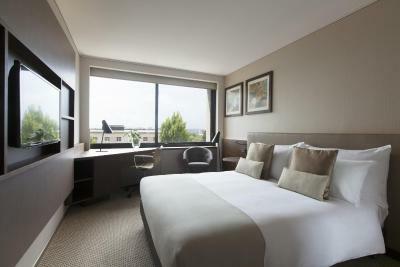 This large air-conditioned room is set on the the top floor of the building and offers panoramic views. It features free WiFi, a mini-bar, laptop safe and a coffee machine. 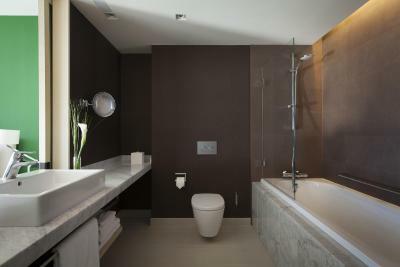 The private bathroom is fitted with a shower and a bathtub, bathrobes, hairdryer and free toiletries. Guests enjoy free access to the Club lounge where they can enjoy tea and coffee, breakfast, snacks throughout the day and beverages and canapés in the evening. 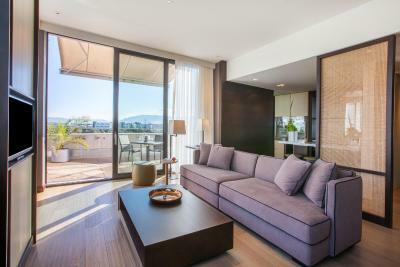 This spacious suite is set on the top floor of the building and offers panoramic views. Guests benefit from free WiFi and have access to the Club lounge where they can enjoy tea and coffee, breakfast, snacks throughout the day and beverages and canapés in the evening. 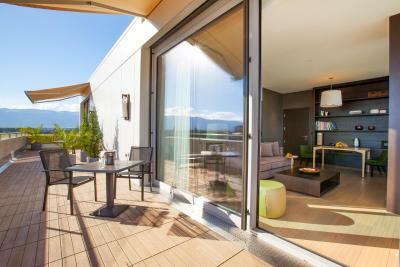 This spacious suite is set on the top floor of the building and offers a terrace with panoramic views over the mountains and Geneva. It features a large living space, a dining area, a work station and a bedroom. Guests enjoy free access to the Club lounge where they can enjoy complimentary breakfast and refreshments. 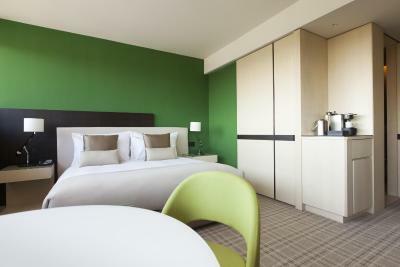 This single room features a satellite TV, electric kettle and mini-bar. 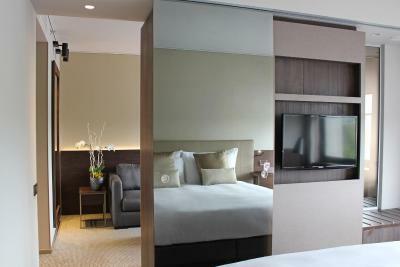 We provide a premium hotel experience that helps high achieving professionals be at the top of their game. By combining seamless services and technology with the right facilities, we enable guests to be productive, feel successful and build meaningful relationships with their clients and colleagues while traveling for business. 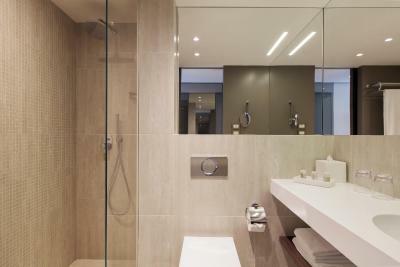 House Rules Crowne Plaza Geneva takes special requests – add in the next step! 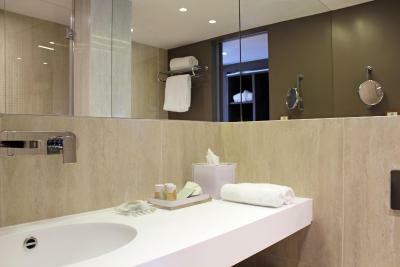 Crowne Plaza Geneva accepts these cards and reserves the right to temporarily hold an amount prior to arrival. Very cooperative staff especially Ali. Booked through Booking.com. 1) You do not earn points 2) Upon checking in they tried to "upgrade" me for €45. Its a game to get back what the hotel paid Booking.com back. 3) Was told to next time book directly with yhe hotel ising the mobile phone application. This way I will get discounts and free upgrades and more. The room was good but you can hear everything from the bathroom next door very clearly! Woken up with next door getting ready in the morning. Location and staff great, nice relaxing atmosphere. Breakfasts are plain and unworthy of this hotel. Room is on the small side, but well appointed. The car Park is TERRIBLE!! It must’ve been built with tiny cars in mind!! The kerbs are real wheel crunchers!! Why do they have to make it so tiny and tight????? The room was quite different to a lot of hotels I’ve stayed in. Very nice. Great location for Palexpo. Good breakfast. Comfy bed. I enjoyed to stay in hotel BUT warning to others - during check-in they take from Your card deposit/warranty amount in 100CHF and later ignore Your letters and don´t do any actions to refund it. So please calculate that You will pay Your hotel bill and give them 100CHF/88 euros. So for some people it is just a small cash. But actually it´s fraud to collect additional bonus. It was nice experience to stay in hotel but please read my negative experience! 8th floor lounge was excellent. Lovely staff and very efficient. The public transport pass was a gift. Room 324 was very small so we were glad to pay the extra and move to 839.